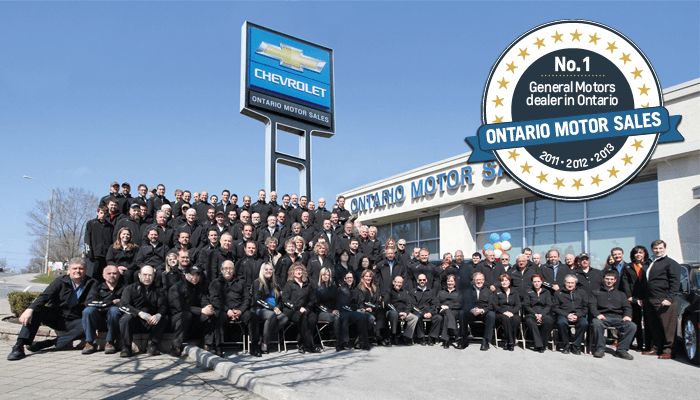 Thanks to our loyal customer-base and some exciting new products in the Chevrolet and Cadillac lines, we are pleased to be recognized as the top GM retailer in Ontario for the third consecutive year. “This is a prestigious honour, and certainly one that we take very seriously. Oshawa has a loyal General Motors following and we truly appreciate our customers and the support we get from the factory employees.” says Tony Willson, President of Ontario Motor Sales, who celebrated their 90th anniversary in 2013. With consumer shopping habits shifting online, Ontario Motor Sales has led the charge in delivering a tremendous internet experience. We strive for total customer access and satisfaction, with a virtual showroom and prompt handling of internet inquiries. “The internet has changed our business. Customers are now doing most of their shopping online, so creating an all-encompassing online experience is essential for us in assisting our customers through the shopping process” says Willson. A visit to our Ontario Motor Sales website demonstrates that we’ve got all of your vehicle needs covered. High resolution images and videos will guide you through the inventory and quick response forms will help you book an appointment or inquire about your vehicle’s servicing. If an answer is required immediately, an OMS agent can chat with you in real-time to answer any questions you may have. Also—with Chevrolet now boasting both the North American Car and Truck of the Year winners for 2014 and Ontario Motor Sales’ dedication to the complete customer experience, a 4th year on top is already in the works.